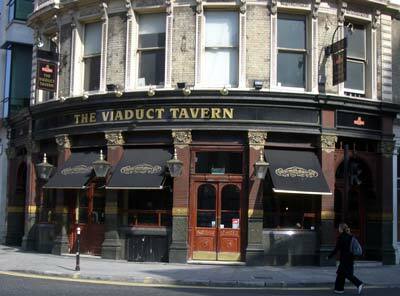 Across the road from the Old Bailey you can find The Viaduct Tavern, a lovely pub with plenty of original features to enjoy once inside, although it's a lot smaller then it looks from the street. Built in 1875, this is the last example of a vitorian gin palace and is reputedly haunted by a murdered prostitue. Some of the lunchtime clientel looked like they were waiting to pop over for their case to be heard! The tavern is built on the site of the sheriff's prison demolished in 1855, in the cell there are five original prison cells from when it was a house of correction. If you step out of the front door of the Viaduct Tavern and look right along Holburn Viaduct you will see a church, this is St. Sepulchre-without-Newgate, the largest Parish Church in the City of London. In the south aisle on a pilar there is a glass case containing the "Execution Bell", a hand-bell rung by the night-watchman of Newgate Prison which stood until 1902, on the site now occupied by the Central Criminal Court - "The Old Bailey".